There seems to be a lot of confusion when it comes to renters insurance coverage. People aren’t quite aware of what this type of insurance covers and what it doesn’t, as well as how it keeps them safe. The truth is, however you take it, renters insurance benefits a renter more often than not and it’s a basic investment that will bring you peace of mind and keep you safe when the trouble comes. On top of being insured and safe, renters insurance is so cheap and affordable that it literally won’t make any difference in your monthly income. The most important thing is, it will cover your stuff in case of an emergency. Insurance is always a good investment and renter insurance isn’t an exception. With that in mind, let us take a closer look at what renters insurance is, what it covers and how it actually keeps you safe during those unfortunate times. Insurance isn’t meant to prevent disasters and unfortunate events from happening – it’s meant to help reimburse you in your time of need. If we take that into consideration, we can safely say that renters insurance is a form of safety for you and your stuff. In case of suffering any loss or damage due to fire, burst pipes and other types of water-related damage, burglary, theft or vandalism, renters insurance helps you cover certain legal and medical fees as well as temporary living expenses. Fire is a standard peril covered under renters insurance. Bad things like fire can destroy your stuff but if that happens, you can count on your renters’ insurance policy to keep you covered. Still, there’s a catch here. If the stuff in your apartment isn’t yours but belongs to your landlord, then your insurance policy doesn’t cover you. Your policy covers only the stuff that directly belongs to you. On the other hand, it’s good to know that in case of fire, lightning, hail, windstorm, explosion, damage from smoke and other similar perils, your renters’ insurance covers you for any loss or damage. So, if your home or apartment is destroyed in a fire, taking everything you own away from you, your renters’ insurance will help you rebuild your life and cover all financial loss. To find out more about 16 different types of perils that renters insurance covers, read this ultimate Lemonade rent insurance for apartments guide. When it comes to water-related damage, some types of water losses like burst pipes are covered. However, natural disasters such as floods aren’t covered. Still, if your typical renters’ insurance policy doesn’t cover natural disasters such as earthquakes or floods, it’s quite possible to get additional coverage and protect your stuff against natural disasters and perils of mother nature. Flood insurance can be purchased separately but in case that there’s an overflow, broken pipes or a water leak that causes water damage to your stuff, then you’re covered. If you need more details about renters insurance, all the necessary information can be found here. In case someone breaks into your apartment and steals or intentionally breaks any of your stuff, your insurance covers you. The only thing important here is to know that the things in question have to be in your name or they need to belong to you in order for your insurance policy to cover you. Even theft outside of your home is covered. Also, if you keep valuable items such as electronics, watches, expensive jewelry or fine art, it’s possible to add some extra coverage for that as well. The only thing you’ll need is proof of purchase or appraisals and that’s it. Of course, it’s best to try to secure your home so that this doesn’t happen, but you have to plan for the worst, and burglars can be quite crafty. Typical renters insurance also includes liability coverage. So, in case that someone gets injured within your rented home, your insurance will cover you for all the necessary expenses. If someone sues you due to getting injured in your home, all the legal expenses up to the limit of your coverage, as well as court judgments will be covered. The insurance protects you in case something happens and you or someone else become injured. Without it, you’re vulnerable since you’re completely liable for what happens in your rented home. In case someone decides to sue you, your insurance covers both your legal responsibility and personal liability. Renters insurance is a quite useful and pretty affordable way to protect yourself, your belongings and property from damage and loss. One of the most important aspects of any renters’ insurance is making a decision whether to purchase actual cost value or replacement value coverage. It includes liability coverage that covers you in case of fire, theft, water leaks or if someone gets injured within your rented home. 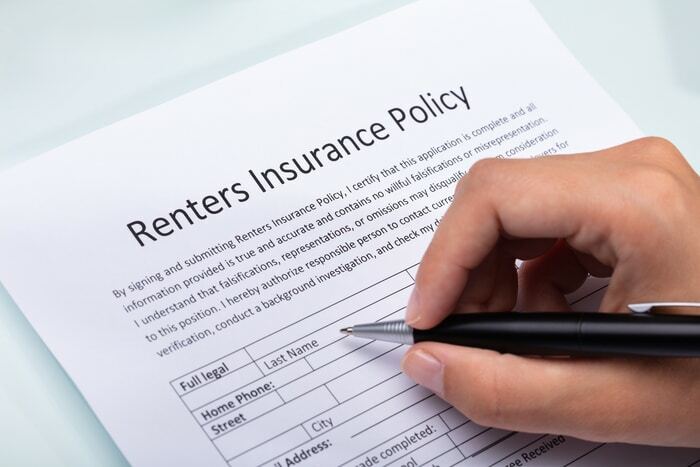 Perhaps the biggest benefit of renters insurance is the coverage of temporary living expenses if your home becomes unlivable because of fire or water damage and similar perils. All in all, it’s safe to conclude that you should secure your possessions, as they are worth protecting. Avoid loss or damage and take all the necessary precautions in case of unexpected events because that’s what renters insurance is all about. It’s always better to come prepared, especially when it comes to your life, safety, belongings, and property.